If you would like to live in a warmer client with all of the amenities of Oakwood Country Club, check out this newly listed home. This one-of-a-kind, Barcelona has a guest house and private courtyard. 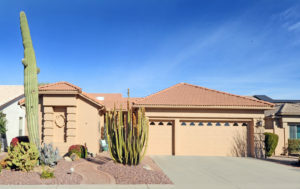 With that in mind, you’ll love the immaculate, open great room floor plan with large windows overlooking the entire #8 hole on the Sonoran golf course. First of all, there are 2 Master Suites with bathroom upgrades. And the kitchen has gorgeous, updated granite and kitchen cabinets, a double oven, a custom hutch, custom crown molding, and an extended island. In other words, this is move in ready and just waiting for you! Plus, there are beautiful views of the private heated pool, spa, natural gas fire pit, built-in bench seating and golf course. Furthermore, there is an extended laundry room with cabinet storage and a granite counter. And you can also take advantage of the high-end, updated lighting, fixtures, faucets, and landscaping with two water features. For energy efficiency, there are insulated silhouette blinds. And you’ll love the space provided with the 2 car PLUS golf cart garage and built-in storage cabinets. There is also a new, PVC drip system. This home can be sold turn-key! 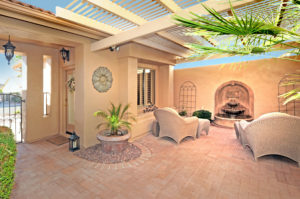 If you want to buy a home in Oakwood Country Club in Sun Lakes AZ don’t miss this one. There is no remodeling or work needed. You can just start enjoying the Oakwood Country Club resort amenities from day one. Resort amenities include golf, tennis, pickle ball, pool and spa, a workout facility, a clubhouse and rec room, walking/bike paths, lakes, card clubs, restaurants, bars, concerts, a gated community with an on site guard and Concierge, and so much more! Please call us at (480) 440-0849 or click here to learn more!